Hound TV – The show for dogs! (and dog lovers) » It’s always Year of the Dog at Hound TV! It’s always Year of the Dog at Hound TV! I don’t know much about the Chinese Zodiac – but it’s always Year of the Dog at Hound TV. So happy New Year! I suppose you’ve been wondering where the heck we are – and if we’ve ‘podfaded‘ or something. We’ve been taking a well-deserved break, lying in the Aussie sun, and dreaming about big juicy bones. That, and planning our content for 2007. Tomorrow is Australia Day/Invasion Day, and we’ll be visiting a flyball competition to find out all about this fun sport for dogs for our first episode for the year, which should be up in a week or so. Stay tuned! Hey there Guys you interviewed me and Matilda (Kerkens Waltzing Matilda) on Australia Day at the flyball comp. I wanted to say thanks for your time and look forward to seeing matilda. Apart from breeding mini bull terriers my husband and I own the largest internation bull breeds forum – http://www.bullbreedsonline.com . We have 2615 members and the membership is predominantly Australian, UK, Europe and USA based. Our forum is for Bull Breed Owners (Bull Terriers, Staffordshire Bull Terriers, Bull Mastifs, Amstaffs) but we welcome all breed owners who have a soft spot for the bull types. We are in the process of hold a huge BBO Barbeque and would love it if you guys would come along and see how the bullies kick up their heels. This is going to be held in Victoria, probably in either Ballarat or some where like a Confirmation Show. Anyway thanks again and look forward to seeing more of you guys and your interviews and outings. Thanks for the interview on Friday, Matilda was great. I’m sure everyone is going to enjoy seeing her and learning a little bit about Mini Bull Terriers! Would love to come to your barbeque. Keep us posted and we’ll see if we can work it into our schedule. I just wanted to say thanks for interviewing me. It was my first interview and I really enjoyed it. If you cant tell I live for flyball, and I nag my human owner into doing flyball as much as possible. Cant wait to show my doggy mates the interview, and I hope you got my handsome side (black eyed side) and not my white side, as I tend to blush! Hope you all had a great time at the Flyball comp – I know I did. My human owner is still recovering. 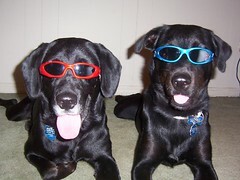 Bear and Avery extend their thanks for using their picture!! I have to say you looked pretty nonchalant about being on camera (immediately after the flyball story in episode 14). I guess you were probably keen to get to your next game of flyball! No, really, thanks for modeling!